Ever since he announced his candidacy for the U.S. presidency, Donald Trump has been hogging the limelight. And even until today that he has become the new president of the United States of America, he continues to gain international attention particularly from the media. In fact, reports have it that the media helped create the Trump phenomenon owing to their frequent coverage of him on television. There’s no doubt that the new U.S. president’s popularity was driven by the media as confirmed by a recent study. The research done by Harvard’s Shorenstein Center on Media, Politics, and Public Policy looked into the news coverage of the 2016 presidential candidates by the mainstream media during the so-called invisible primary. According to the researchers, the most vital indicator of success during that period is media exposure and Trump achieved just that. Specifically, the study noted that the coverage of major news TV networks from CBS, NBC to Fox News as well as major newspapers such as Los Angeles Times, USA Today and the New York Times was not the usual. It stated that their news coverage was more extensive and positive in tone and this boosted his polling numbers. Hillary Clinton, on the other hand, got mostly negative news coverage. For the 11 months that the study was conducted, Clinton’s negative news overshadowed the positive ones. In terms of media value, the Shorenstein Center report said it was clear that Donald Trump enjoyed free advertising worth an estimated $55 million. Of that amount, the researchers said about $16 million came from New York Times alone. Trump’s loud personality and use of the social media during his campaign attracted him to the major media outlets. And the researchers pointed out that most often, journalists are excited to cover what’s new, what’s unusual and sensational that can attract the attention of their audience. 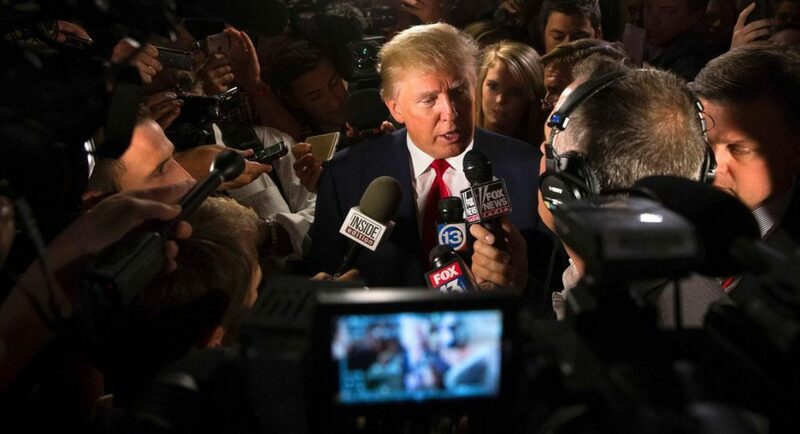 For many journalists including political analysts, Trump is described as a disruptive force and a game changer. Even early on, there were already questions about whether his administration would be as unconventional as his personality. Now that he has assumed the presidency, Donald Trump continues to gain much public and media attention. For example, his decision to ban citizens of Syria and six other countries in the Middle East coming to the U.S. has caused anger and confusion resulting in more media mileage. Immigrants and refugees who were stranded in airports have called out to Trump to be more considerate while civil rights and religious groups as well as activists have staged protest actions and vowed to fight the order implemented by the federal government. But with all the media exposure he has been getting since last year, the new U.S. president is not in very good terms with the press. In fact, he boasts about his war with the media and remains hostile towards reporters. Media outlets, for their part,t have also started to make changes in their activities, doubling their efforts and committing to fight back the false news being spread by the administration. Many are firm in their stand to cover Trump as they’ve done with other presidents in the past. some are even hiring more staff (junior and senior reporters as well as columnists, in particular) to ensure that they are covering the administration’s policies and affected communities well. More importantly, media outlets are doing the best they can to provide fair, accurate, objective and comprehensive news to the public and maintain their credibility. They are bent on not letting their guard down despite the attacks made against them by the federal government. The only difference is that they are covering more extensively now than they were in the past to make sure they are not left behind on what the Trump administration is doing.